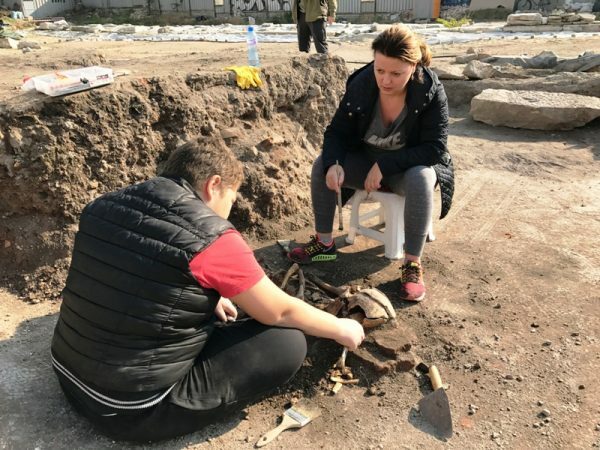 A Plovdiv regional prosecutor who volunteered to take part in archaeological excavations at the Bulgarian city’s Great Basilica site has participated in the finding of a human skeleton. Examining the remains, prosecutor Gergana Mutafova said that they appeared to be of a middle-aged man, with the skeleton dating from the 10th to the 11th century. And, she concluded, there were no signs of violence. So a crime was not suspected. Probably good news for Plovdiv police, who are saved from seeking out some fairly ancient suspects. Mutafova is one of nearly 20 enthusiasts assisting at the site of the Great Basilica, the largest ancient Christian church to have been found on the Balkans. The site of the Great Basilica, understood to date from the fourth to the fifth centuries, is near Plovdiv’s 19th century Roman Catholic St Ludwig church. After the discovery of the remains on November 19, Mutafova carefully used a brush on the skeleton, to examine the skull, ribcage and femurs. The skeleton was on a mosaic near the main entrance of the basilica. A small ceramic tile had been placed under its head. Other human remains were found nearby, part of a large mediaeval cemetery that had been located at the site. Archaeologists also have found the remnants of a beautiful marble fountain in the courtyard of the basilica. They believe that it would be possible to fully restore it. The dig team hopes to be able to continue work in December. Every day the site was yielding more valuable information, archaeologists told local media. The Great Basilica project is moving on schedule and is expected to be completed by the end of 2018.